stevereads: I Am Mary Tudor! 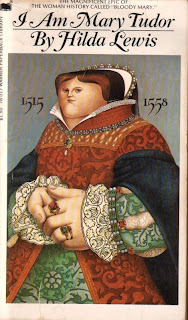 Our book today is Hilda Lewis' magnificent 1971 novel I am Mary Tudor, in which the only surviving child of Henry VIII and Catherine of Aragon narrates her own tempestuous history, from the earliest years she can remember (and since she was a Tudor, that was pretty damn early) to her triumphant entrance into London upon successfully seizing her crown from the usurper Northumberland and his puppet poppet, Jane Grey, the famous nine-days queen. When Mary's half-brother King Edward VI finally died after a sudden illness (I am Mary Tudor agrees with those suspicious Aloysiuses out there who think the boy was poisoned), Northumberland had everything planned: his son would marry Jane Grey, who had just enough royal blood on her veins to qualify her as a legitimate candidate for the job of queen - and presumably Northumberland would rule through the two young people. Henry VIII's daughter Elizabeth couldn't be seen as standing in the way of this plan; not only was she virtually a prisoner of the state, but her mother, Henry's second wife Anne Boleyn, was no more popular dead than she'd ever been alive. The real fly in the ointment was Mary, the fully-grown daughter of the old king and his Spanish queen - Mary had never backed up one inch from the assumption that the crown should come to her before it ever went to Elizabeth or any other woman (remarkable as she was, even Mary was a creature of her times ... she'd have been willing, though not exactly eager, to see Edward rule). Edward's death gave her what she knew was her only chance. The really inexplicable thing is that Northumberland must have known it too, yet Mary wasn't immediately taken into custody - instead, she was able to rally the shires and counties to her banner, remind the majority of the nobility where their loyalties lay, and beat Northumberland to all the vital stores of weapons and money outside of London proper. By the time the lords of that city informed Northumberland that they were supporting Mary, he must already have known how badly he'd botched things. His protestations of a hasty conversion to Mary's cause were an insult even to her ordinary counsellors - goodness knows what they must have sounded like to Mary herself, who had all the Tudor scorn for anybody who thought they could out-think the royal brood. You are the King. Over and over again; nor had Seymour been ashamed to bribe the boy with money. Somerset kept the King with a lean purse. He had everything a boy could wish - horses, hounds, clothes and jewels - but money to make a gift or to reward a service, he had little. So Seymour would put his hand into his pocket and bring out a handful of gold. It is disgraceful to keep a King so short. Say nothing to my brother. There's plenty where this comes from. You have but to ask. I'll not see you go short! And Yes, the boy would say, Yes, you are my dearest uncle! And never a sign on that pale face of the anger that consumed him; anger that this fool should not only try to fool the King but dare aspire to the King's own sister. Mary had a largely unhappy life. She was devoted to her mother (and, according to I am Mary Tudor, to her father as well), mourned her deeply, and suffered intentional humiliations at the hands of Anne Boleyn, who made her one of the maids-in-waiting to the infant Elizabeth. Mary's own lady-in-waiting, her beloved Lady Somerset, was shamefully executed by a vengeful Henry in retaliation for her son Reginald Pole publicly denouncing the king's remarriage. Mary herself was often ill and oftener thought she was. We find in her all the steel of her father but none of his mercurial gaiety (which her sister Elizabeth had in full measure); she clung to her rights because she had nothing else to cling to - no poetry, no hunting or hawking, no suitors or illicit lovers, no larger worldview. 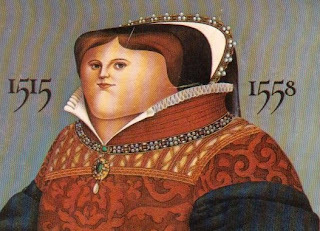 It's likely she wouldn't be an attractive figure in the roster of England's rulers even if she'd stayed on the throne for twenty years, instead of five. And so my thoughts came again to that other prisoner - to Jane Grey, her royal escutcheon torn from the Presence Chamber in this same Tower, by the hands of her own father. For nine nights she had slept in this very chamber, in this my very bed. The thought was sudden, and sudden my anger. I could scarce breathe until reason came to lighten my wrath and give me back my breath again. 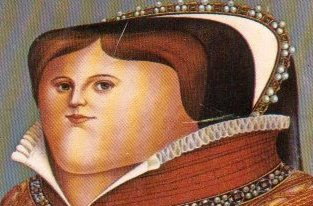 I am Mary Tudor is one of the strongest, best, most involving and thought-provoking Tudor novels ever written, mostly because Lewis finds the perfect narrative voice for her central character, but also through the judicious application of a little dirty pool. The book ends just as Mary is entering London in triumph - virtually on the last page of the novel, she's still determined to spare the life of Jane Grey no matter what her Council wants. We, the readers, know that she will not spare Jane Grey - that the girl's execution will be just the first in a long list of moral - and mortal - compromises Mary will make in her reign. Lewis is smart and also tactical to end her book before Mary starts burning accomplished statesmen and village simpletons for their religious beliefs, before she convinces herself that she's pregnant and invites a Spanish lout to rule England in her name. Mary Tudor up until 1553 deserves to be the hero of her own novel, and she couldn't do better than this book. I whole-heartedly recommend it, should you ever come across it (it's out of print, of course). Great post. But the imagery? you know what else is friggin creepy? YOU, that's what! Hee. Snort. (Insert sound of Steve snorting). Mary Tudor is my favourite queen of England. So bloodish, spanish and foolish. she was, for me, the London Tower herself. I’ve read a number of the content material articles on your web site now, and I completely like your type of website. I included it to my favorites website directory and should be coming again quickly. Bear in mind to check out my website too and inform me what you think. Who did the cover portrait? October 2009 in Open Letters! Comics! Gods and guys on the subway! Comics! The week's highs and lows! September 2009 in Open Letters!